Once a regular analysis has been performed, the user is automatically redirected to the results page. The results page is the starting point to handle the analysis results and provide a wide range of features. 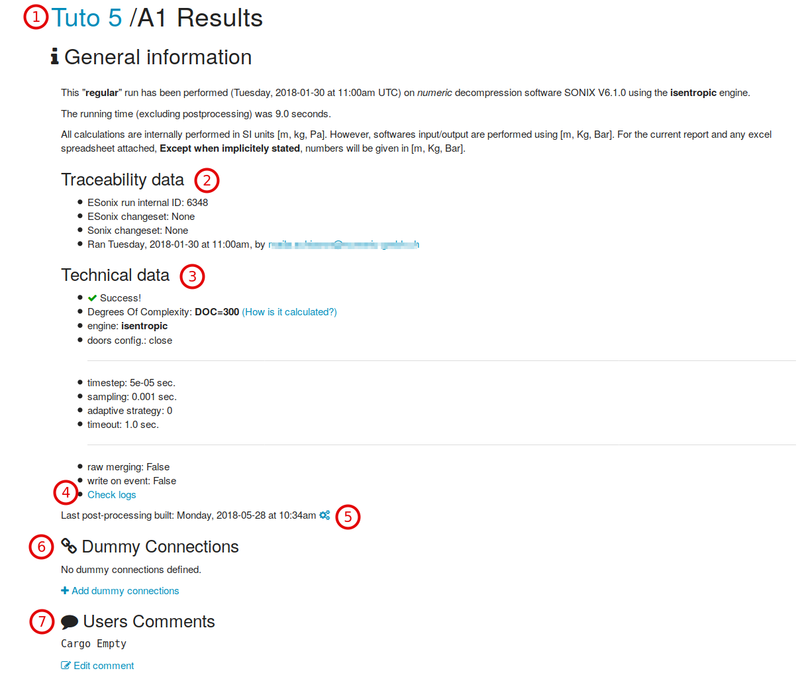 The General information section is located on the top of the results page and provides useful details on the analysis, like the engine used, the timestep, the Analysis’s degree of complexity (aka doc), etc. The log is filtered by default to print only the “warning” and above messages. When running a cabin, it is frequent that some partitions are completely blind, featuring no connection at all. This means that ESonix has no clue about the existence of such a partition and ESonix will therefore miss an interface. [advised] Define a dummy connection in the model itself. This means add a connection with, for example, a vent_area_i_to_j==0 . As a result, ESonix will take this interface into account when reducing the envelops, with no effects on real results, since the connection is always closed. Define a dummy connection after the analysis is performed. ESonix will be able to reclaculate the new interface’s envelops afterwards. This is however a poor workaround compared to modifying the model, as it would have to be done after each run! however, if by mistake, the dummy connections has been forgotten from the model itself, it can be convenient to create them from the post processing page. For example, if some blind partitions exist between volumes 1 and 3 and 1 and 4, they can be defined by creating dummy connections like in Fig. 8.2. The input cell expects a coma-separated list of volumes. If N dummy connections are to be created, 2xN volumes ID need to be input. “1,3,1,4” would therefore define two dummy connections: “1/3” and “1/4”. Users comments is a free text allowing the user to store some info about is run. Comments can be created before the run (cf. advanced_parameters_paragraph and new_run_advanced_parameters, item 7). They can be modified at any moment. Spreadsheet uploaded by the user for analysis. 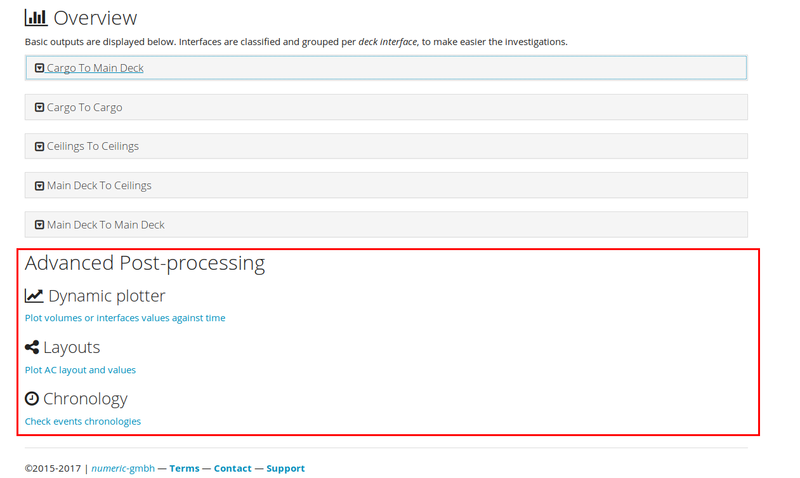 Useful for traceability to recover the analysis input data. The RAW Model derived spreadsheet, as pre-processed by ESonix. This spreadsheet is useful to check how ESonix has filled the holes during the pre-processing phase. “min” values refer to the Δp from I to J, whereas “max” values refer to the Δp from J to I. From Fig. 8.4, interface between volumes 1 and 2 (first row) has always a positive pressure pusing from I to J, whatever the load case and time. This tab provides an envelop per load case (including all the interfaces). The same kind of data as Interface envelop tab are provided. Besides per interface and per load case envelops tabs, a detailed peak results is provided per each load case in the next tabs. 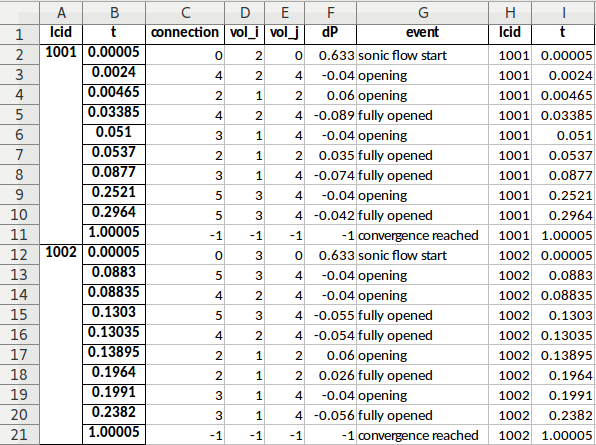 Events spreadsheet provides details on events (decompression features opening, sonic flow, etc.) occurring in the Aircraft during the rapid decompression event. 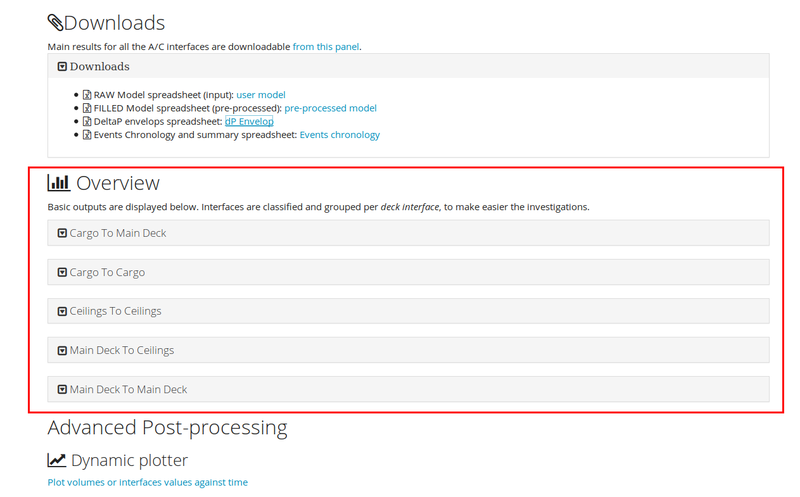 This tab provides chronology of events per load case. 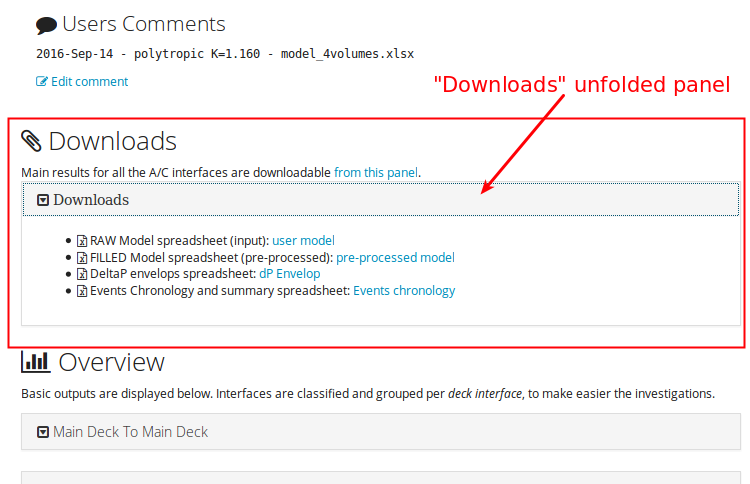 This tab provides information about events per interface, all load cases included. The next column counts the number of times the feature is activated. #LC active: number of load cases where the feature is activated. A “0” in the #LC active column would mean that the feature is never activated during the simulations, and therefore probably useless. The next N columns (where N is the number of load cases) provide the time at which the decompression feature is activated. The last columns provide as ever a duplicate index to facilitate filtering. This section provides dynamical overview about the simulation’s results. Based on the “deck” parameter provided in the model (cf. 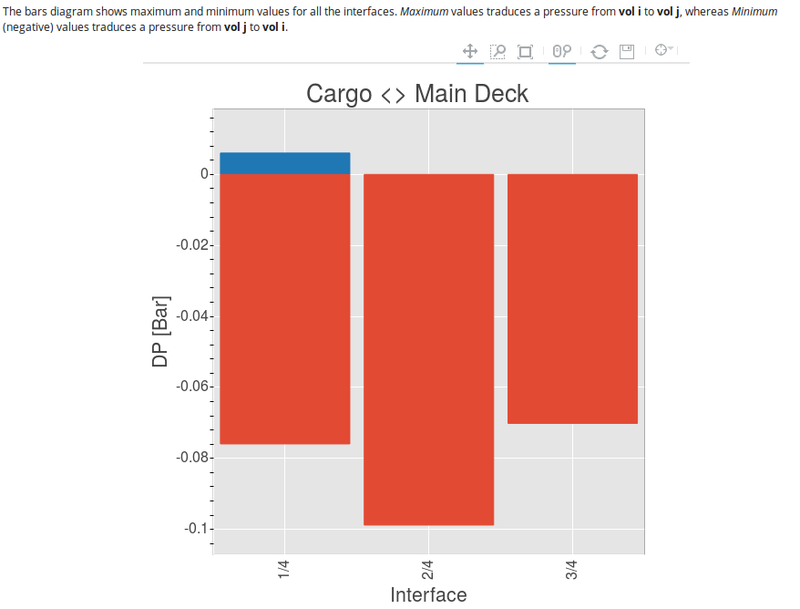 deck), ESonix organise results per deck interface, for example cargo to cargo, cargo to main deck, etc. The heatmap (as shown in example pp_heatmap) provides a fast overview about the Δp for each interface (X axis) and all load cases (Y axis). The Deck Interface histogram plot per interface (X-axis) the max (i to j– in blue) and min (j to i – in red) Δp calculated throughout all the load cases. It is a convenient way for the engineer to check which Δp is to be taken into account for its partition, providing additionally some more details about the direction. 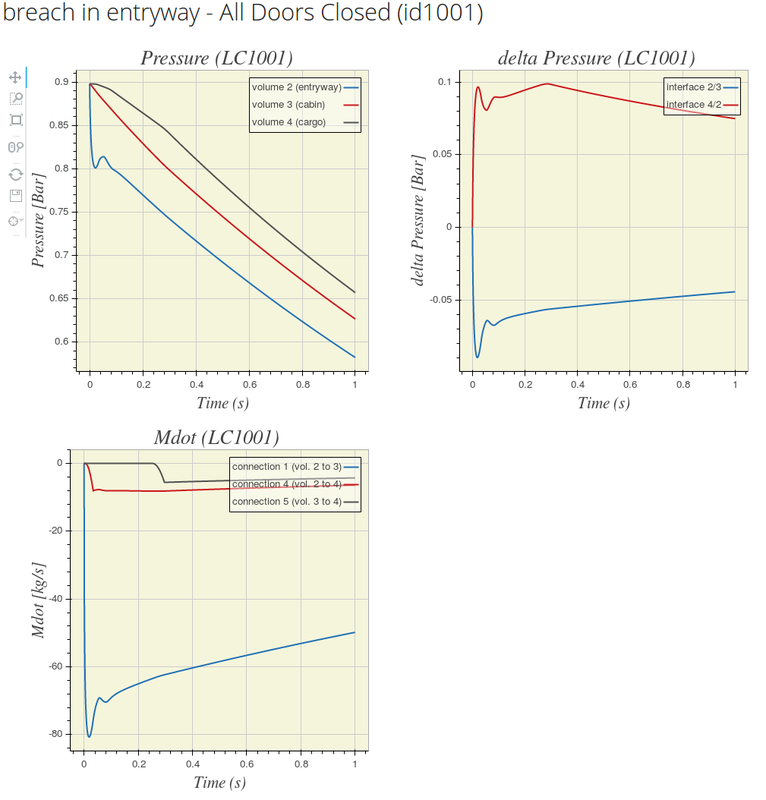 The advanced post-processing Section provides dynamical online tools for deep investigation of the decompression phenomena. It is the section to be familiar with when dealing with optimisation, or solving some major unsustainable Δp. The dynamic plotter plots volume, interfaces and connections data over time. 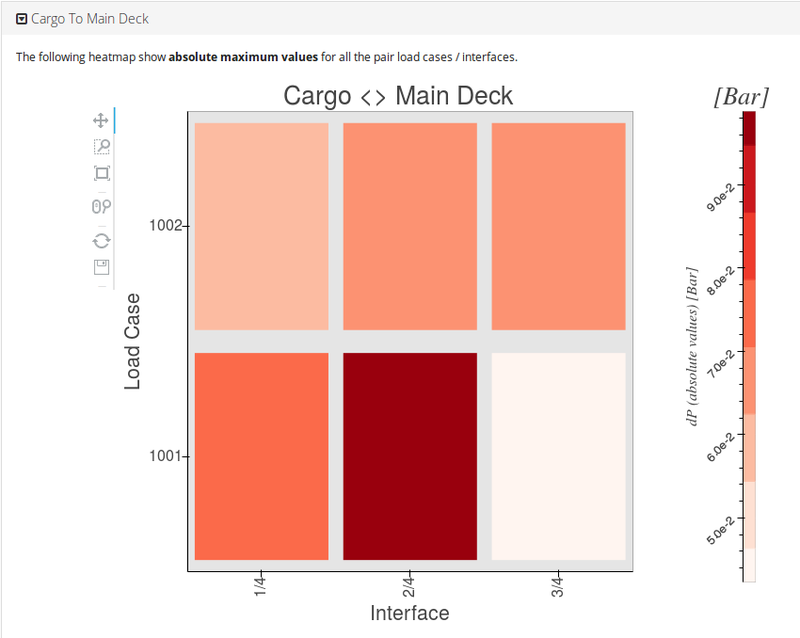 if the number of volumes to plots is uneven and Interfaces data is selected the following error message will occur “Plotting data from interface requires a single volume OR an even number of volumes” as the Interfaces data is based on a pair of volumes. All the tools available for regular runs are available for Combination Analysis (cf. Combination Analysis), including sensitivity capacities. It needs to be kept in mind that Combination Analysis load cases result from a load case mapping of the combined nodes as illustrated Table 6.1). 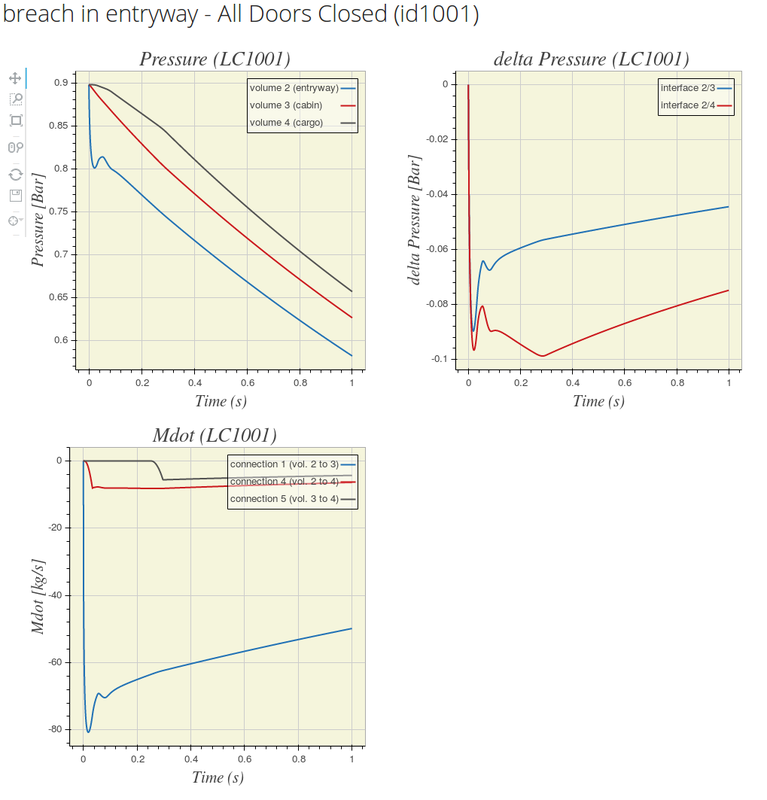 For each load case of the reference node results, max Δp and the relevant interface are identified. For each one of the nodes used to calculate sensitivity, Δp are retrived for the reference critical interface found previously. Statistics are therefore based on those Δp’s.